Lana Del Rey has been secretly engaged to her million dollar man, Barrie-James O’Neill, after he proposed sometime last summer. 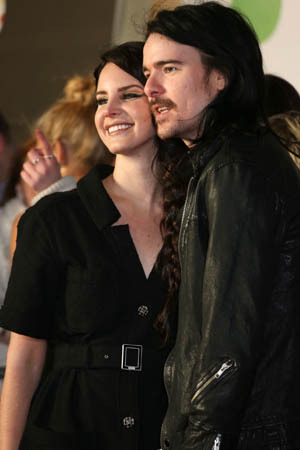 After a secret summer proposal, Lana Del Rey and boyfriend Barrie-James O’Neill are now engaged, according to new reports. The 27-year-old singer and her fiancé, who plays guitar for the Scottish band Kassidy, became engaged last summer. O’Neill seemingly popped the question around the same time the pair was seen house shopping in Los Angeles, Us Weekly reported. The engagement rumors flew high when the pair was seen looking for a home together, but soon fizzled when no news of a future wedding surfaced. Apparently, Del Rey and O’Neill did an awesome job at keeping the proposal a secret, even though the “Summertime Sadness” crooner was wearing a very blatant diamond rock on her finger. The happy pair has been together since 2011, and while Del Rey usually sings about love loss, she confessed that being in love really made her feel alive and happy. Del Rey also admitted that one of her more love-positive songs on her Born to Die album, “Off to the Races,” was inspired by those feelings and said the tune is all about the gleeful feeling one gets when in love. While her rep did not return any requests for comment on the engagement news, several sources have confirmed that Del Rey is indeed engaged to be married.